So, you agreed to bake pie for the big dinner this week. You had high hopes of learning to make crust from scratch, complete with fancy edges, a lattice top, and all of the frou-frou that you saw on that gourmet food magazine. Then life intervened and you got busy. Don’t worry. Here at Crowded Earth Kitchen, we’ve got you covered! To save time and sanity this holiday week, we’re starting with a store bought, roll-out pie crust. If you’re feeling obligated to make a scratch crust, that’s cool – click on the link above and we’ll walk you through it. 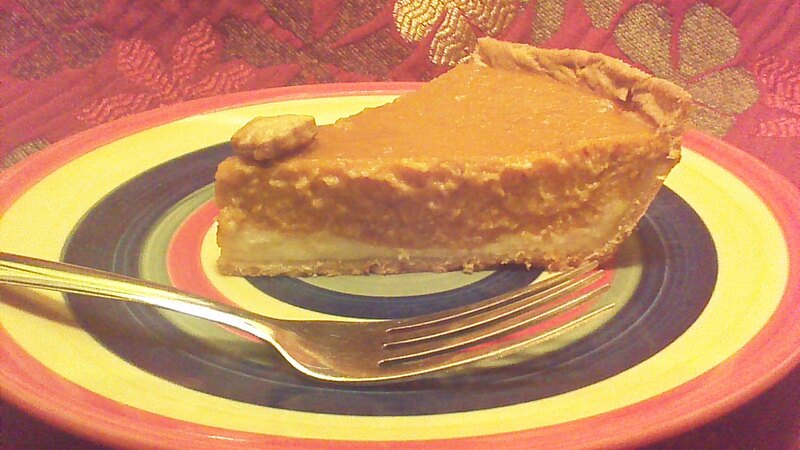 But seriously, nobody is going to shun this awesome Pumpkin Cream Cheese Pie because you skipped a few steps with the roll-out crust. I doubt they’ll even know the difference. 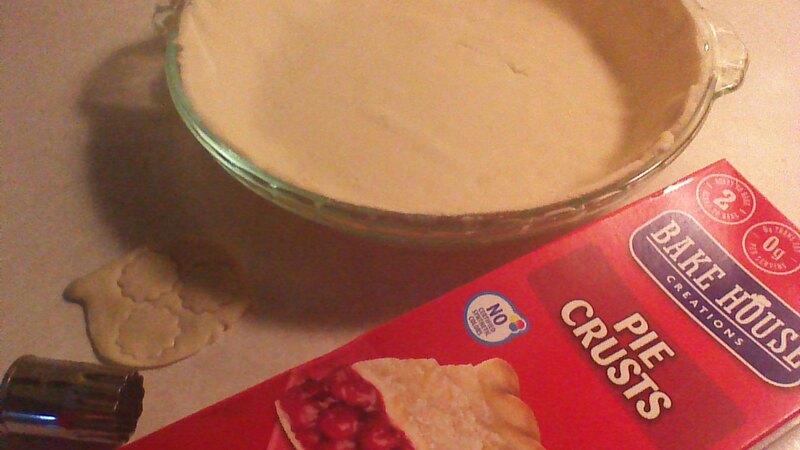 Step 1) Roll pie crust into a glass pie pan. This is easiest when the pie crust has been allowed to rest on a counter top for about 10 minutes before unrolling. If you try to unroll the pie crust right from the fridge, it will crack. If you let it get too warm, it will stick. 10 minutes is just about right! Step 2) Trim the pie crust even with the edge of the pie pan. 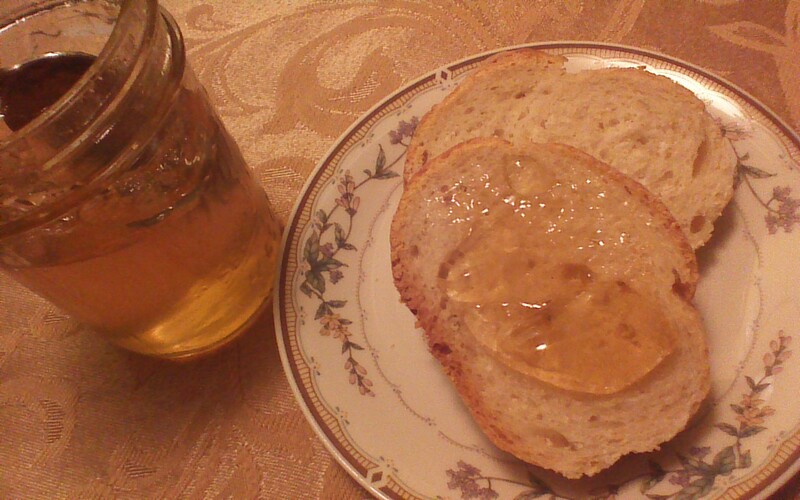 Cut little shapes out of the scraps if you wish, to use as a garnish. 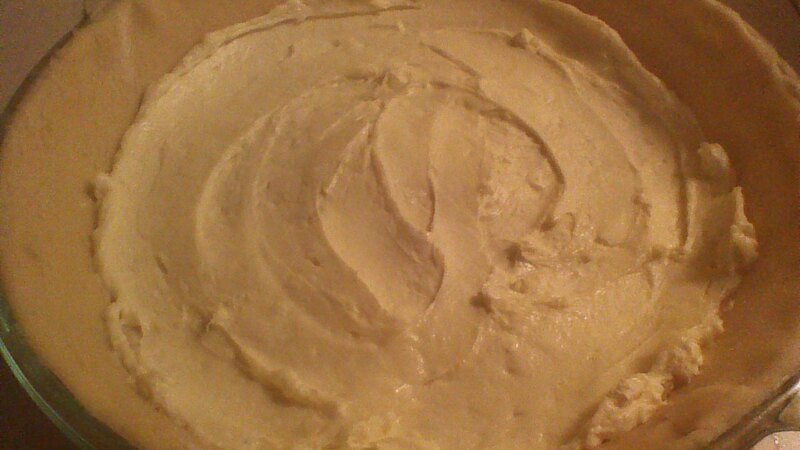 Step 3) Using an electric mixer, beat cream cheese and powdered sugar until smooth. Spread mixture on bottom of pie crust as shown. Step 4) In a medium size mixing bowl, beat eggs and pumpkin. 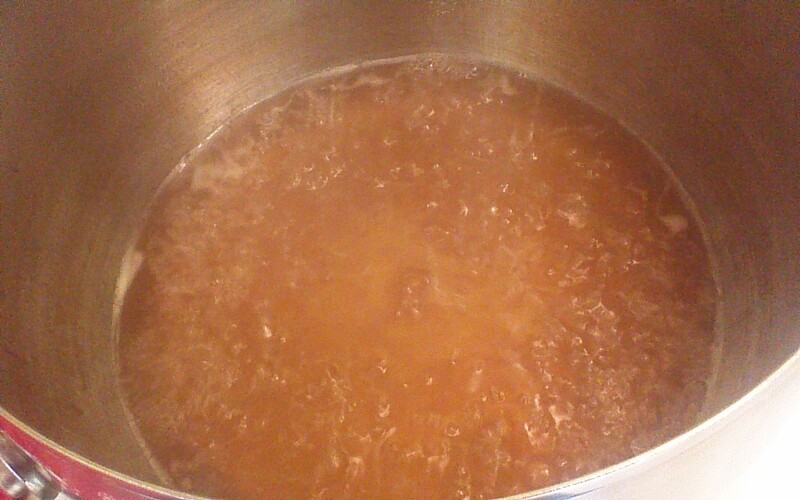 Add sugar, spices, and salt. 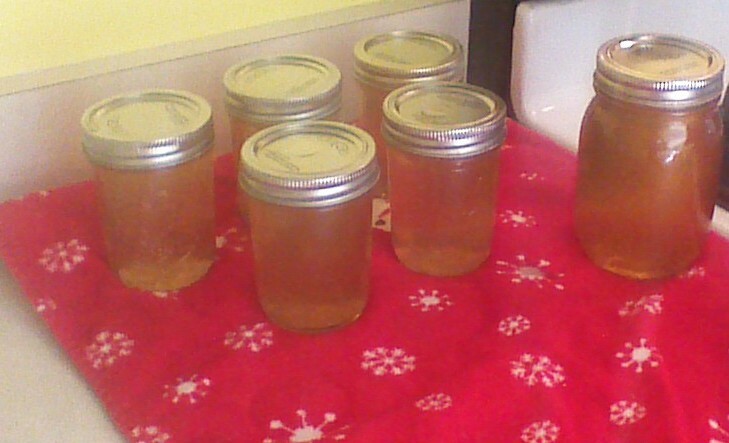 Finally, add evaporated milk a little at a time until fully incorporated. 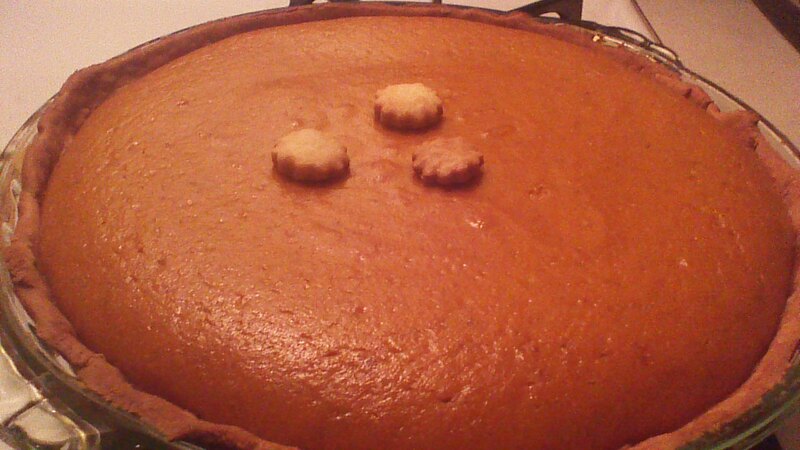 Step 5) Pour pumpkin mixture carefully into your pie crust. Bake at 425 degrees for 15 minutes. 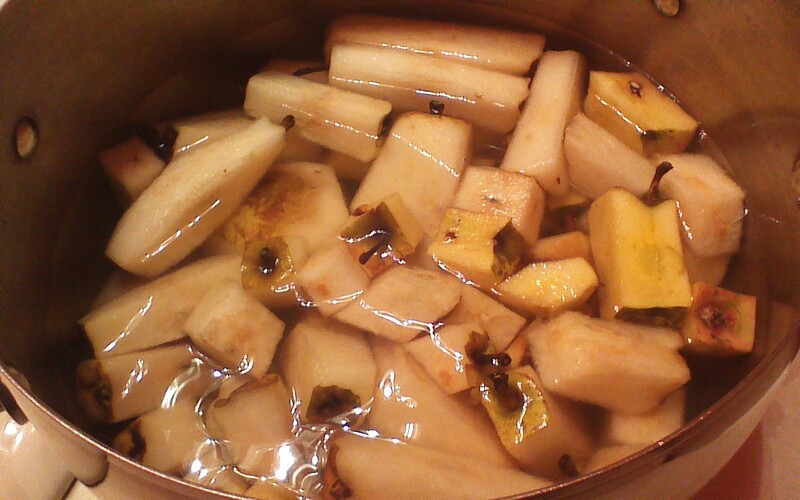 Reduce heat to 350 degrees, and continue baking for 40 minutes. Step 6) If using small crust shapes as a garnish, set small crust shapes on a baking sheet and place in the oven for the final 10 minutes of pie baking time. Place baked crust shapes on top of the baked pie. For many years, I was apprehensive about roasting a turkey. I’m not really sure why. The first year I hosted a Thanksgiving dinner in my own home, I ordered a turkey from a deli – precooked, with ready-made gravy on the side! At the time, it seemed like a brilliant idea. Now, I don’t understand what the fuss was all about. Roasting a turkey is really, really easy. Before we get started, here are a few pointers. Other cooks may disagree – if so, please join the turkey conversation by posting a comment below! If there’s not a big price difference between fresh and frozen, buy a fresh turkey. They’re juicier, which is wonderful because roasting is a dry cooking process. 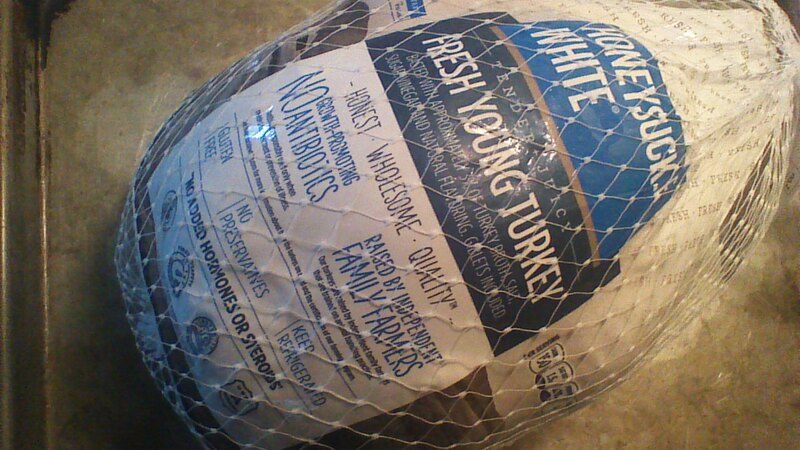 I bought a fresh turkey at Aldi for 99 cents per pound. 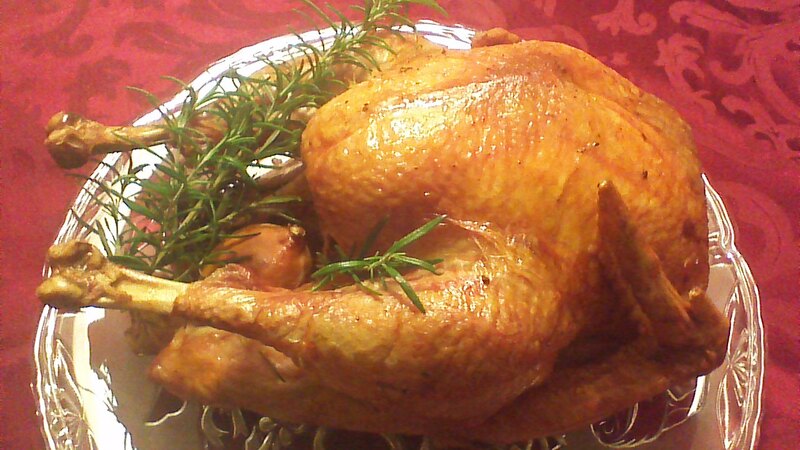 Unless you have 5 or 6 days to allow a frozen turkey to thaw in your refrigerator, you need to buy a fresh turkey. I have never… not once… seen a frozen turkey fully thawed after only 3 days in my refrigerator (which is what the directions on the turkey wrapping often promise). Bigger is not better. If you’re feeding a lot of people, consider buying two small turkeys (10 – 12 pounds each) instead of one, massive bird. Smaller turkeys roast more evenly, and because they require less time in the oven, they are less likely to dry out. You don’t need a special roasting pan, a baster, a “turkey bag” (to cook a turkey in plastic?? ), or any other strange turkey paraphernalia. A 10 pound turkey will fit in a 9×13 cake pan. A larger turkey will fit on a jelly roll pan, or any baking sheet with sides at least 1 inch high. Step 1) In the kitchen sink, remove your turkey from the wrapping. Find the bag of giblets and remove it from your turkey. Check both ends of your turkey for that bag of giblets! Step 2) Rinse your turkey with cold water on the inside and the outside. Lift the turkey and turn it upside down to drain for a moment. Pat the turkey dry with a clean kitchen towel (and put that towel immediately in the hamper, so you don’t accidentally use it for anything else). Step 3) Place your turkey in a pan or on a roasting sheet. Rub salt and pepper onto the skin. Step 4) Poke a few holes with a paring knife in each lemon. 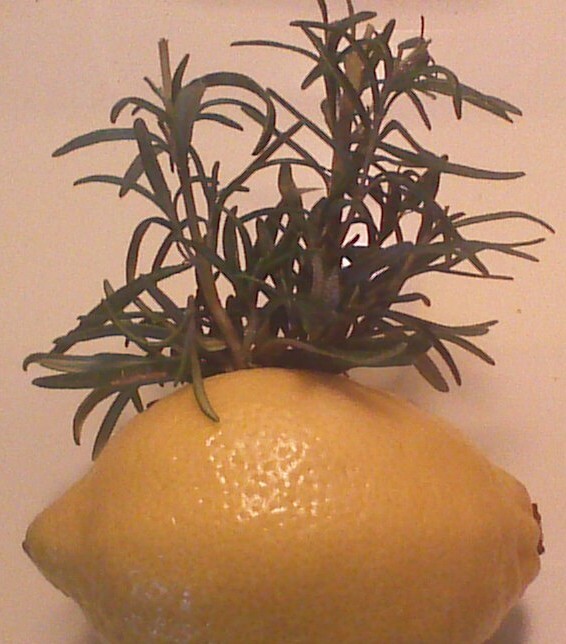 Insert rosemary sprigs into several of the holes in each lemon, as shown. 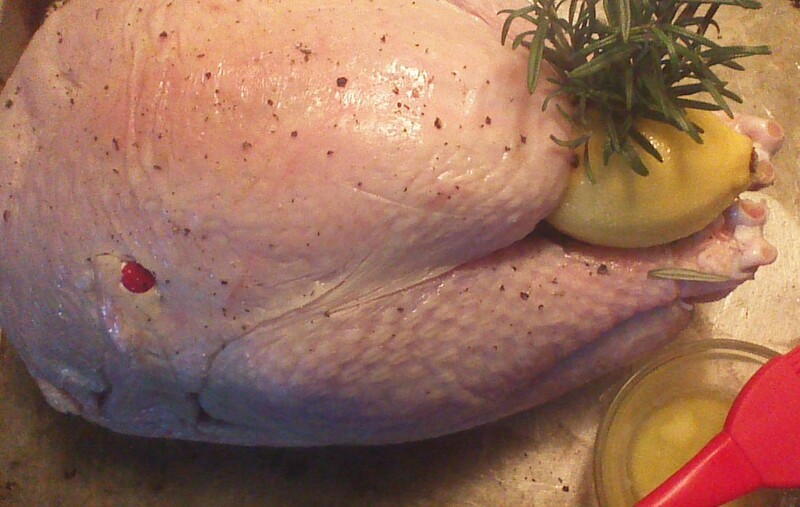 Step 5) Insert one of the rosemary lemons completely inside of the turkey. Rest the other rosemary lemon near the opening of the turkey cavity. Step 6) Coat the outside of your turkey with melted butter. Don’t use so much butter that it drips all over the pan (try to avoid that), but make sure at highest part of the turkey is covered. The butter will spread down the sides of the turkey as it roasts, sealing in flavor and giving the turkey skin a golden color. Note: We are buttering our turkey skin instead of basting. 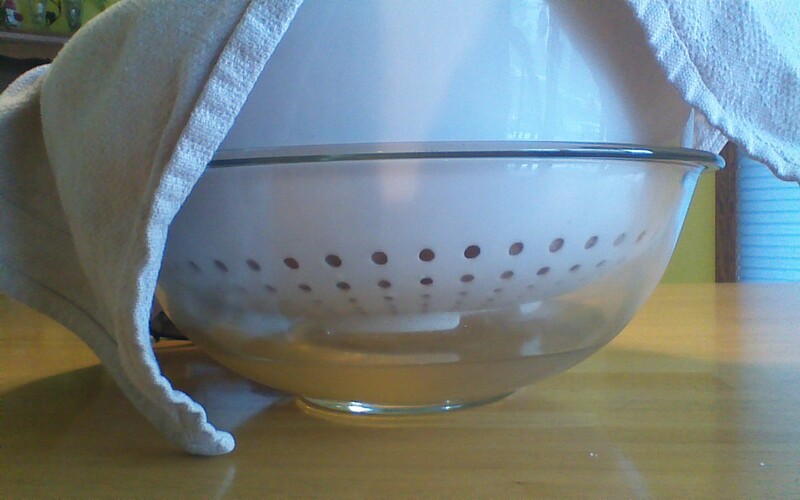 It’s easier and prevents the meat from drying out. A buttered turkey will have a slightly darker color than a basted turkey (or a turkey in a bag), and the skin will be crispy. 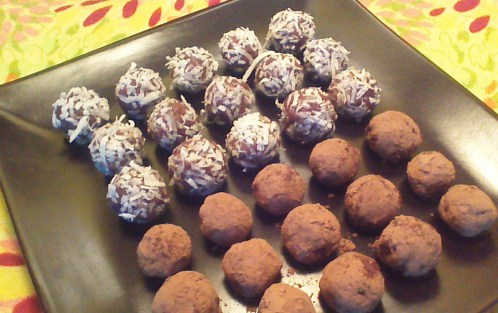 The end result is delicious! Step 7) Showtime! Place your turkey in a preheated, 325 degree oven on the lowest rack possible. Your turkey needs to slowly roast until a meat thermometer poked into the thickest part of the turkey (but not against a bone) registers 165 degrees. Your turkey might have a little red timer attached (see photo) – this timer will pop out when your turkey is done. It’s STILL a good idea to check the temperature. Your turkey needs to reach 165 degrees in order to prevent food-borne illness! How long will your turkey need to roast? That is the million dollar question! Every turkey and every oven is a little bit different. At 325 degrees, a 10 – 12 pound turkey will require approximately 3 hours of roasting time. Check your turkey after 2 1/2 hours, but don’t open the oven door before then! Step 8) Let your roasted turkey rest on the countertop for 15 minutes before carving. A “tent” of aluminum foil (just a very loose covering of foil) can be used to prevent heat loss, but that’s not entirely necessary. PS – Don’t wash that pan! In our next Crowded Earth Kitchen post, we’ll show you how to make gravy with the drippings on that turkey pan!